Pupil January 1799 - 1804. The office Day Book (7 April 1800) has Sword 'Copying Plan of Ground Floor at Aynho'. Revised by Soane. 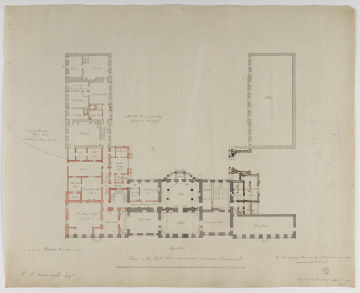 Soane's revisions consist of: giving a bowed porch to the entrance on the north side and (to the north-east) adding a cold bath and re-configuring the link to the stables. More importantly, Archer's 'Great Stair' shown on the earlier ground floor plans near to the north entrance has been entirely replaced by a large domed hall. Subsequently drawing  gives another design for the hall without a dome and with a segmental portico. Later drawings have a 'Stone Staircase' to the north of the anti room.